In 1885, a Professor J F Brown of Berea College (Kentucky, USA) discovered a set of apparently human footprints among those of other creatures in a road cutting at Big Hill, Jackson County (also Kentucky). The deposit in which they were found was a limestone apparently dated to the Carboniferous Era; they were described as being “good-sized, toes well spread, and very distinctly marked” (A E Allen in The American Antiquarian and Oriental Journal 7 (1885), 39). The real problem for this observation is that the prints of other creatures included some identified as a bear and something resembling a large horse; mammals did not exist at the time the deposit was supposedly laid down and one must ask whether they were definitely in the limestone or in a more recent but heavily compacted soil above it or even whether they were simulacra (natural objects that resemble other things) rather than genuine prints. Without an image of these footprints, we are left guessing. There are petroglyphs in a rockshelter at Peter Cave in Jackson County that include “footprints”. The site is said to be south-east of Flat Top Church, on Peter Cave Branch, on the Parrot Quadrangle. There are two human prints, a bear track and bird prints in a panel that covers about a square metre. The “prints” are clearly carved, not impressions in the rock. Other markings could be taken for the footprints of different creatures, but there are also initials carved by visitors in recent times and marks superimposed over some of the “prints”. 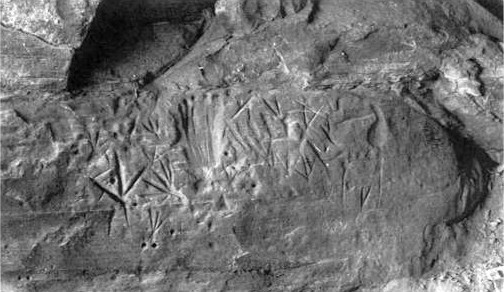 Although the petroglyphs were first officially discovered in May 1993, I wonder if these are the “prints” discovered by Professor Brown. Obviously, the more correct conclusion, is, if they were in-fact human footprints, then one must adjust either the date, or the dating system, such that the supposed age of that layer overlaps that of humans. Creationists of course have no problem accepting any human footprints with any type of land or shallow water dwelling animal, including trilobites and dinosaurs. The fact that evolutionists have a problem with these prints, no matter how obvious it is that the print is human, is an indication to the weakness of their theory. No, that’s not the case at all. Where these supposed “human” footprints have been made available for study – and much of the time, we have to rely on poorly illustrated old reports, as with this example – they are either obviously fraudulent (or, to be charitable, carvings mistaken for fossil footprints) or misidentifications (as with the Paluxy River “mantracks”. As I say in the article, “ithout an image of these footprints, we are left guessing”: remember the motto of the Royal Society of London, the oldest scientific society in the world, nullius in verba (loosely translated as “nothing on say-so”), which applies so well in a case like this. Why does Nathan consider automatically accepting anything one sees, as proof of beliefs already held, to be a positive way of looking at things? This kind of thinking is exactly the definition of non-scientific, non-rational, non-logical, superstitious, etc.